This item has been discontinued by the manufacturer. The Philips HeartStart FR2/FR2+ AED has been discontinued, and has been replaced by the Philips HeartStart FR3 AED, which is available with ECG and would use the FR3 ECG Assessment Module. The Philips HeartStart FR2+ AED with ECG display option has extra accessories available for it that make it more than just an emergency use device. This is just one of them! Your FR2+ AED can be used by medical professionals for general patient monitoring where a full manual monitor and defibrillator might be impractical. To monitor the ECG of patients, use this Philips FR2+ ECG Assessment Module. It provides a nondiagnostic ECG display of the patient's heart rhythm for attended patient monitoring. It is intended for use on a conscious or breathing patient regardless of their age. 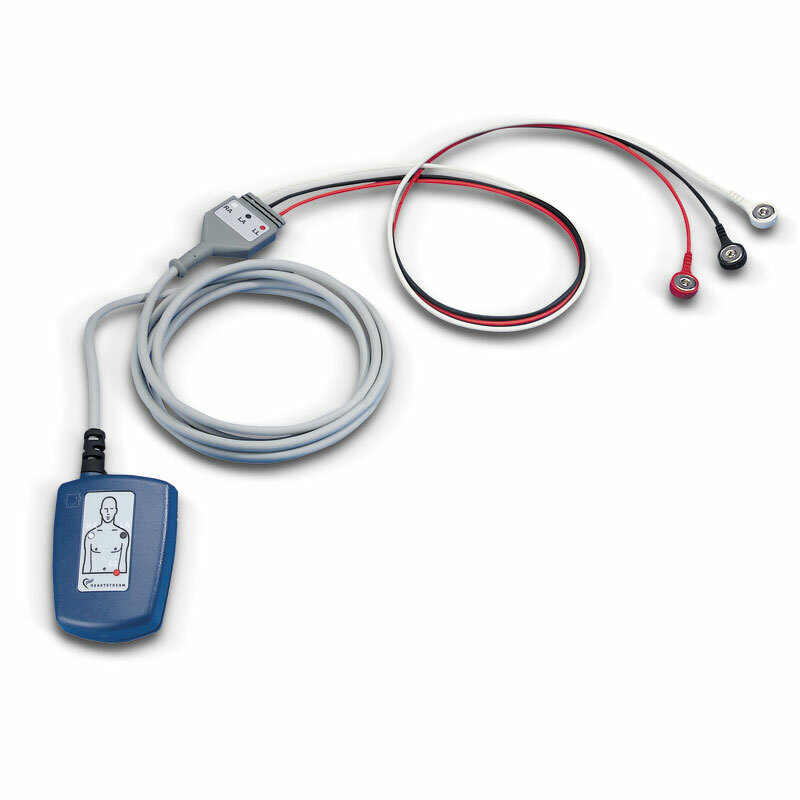 It monitors patients through the use of a 3-lead cable (marked in the standard black, red and white) and displays the ECG in Lead II as well as the patient's heart rate. This is Important! The Philips HeartStart FR2+ ECG Assessment Module can only be used with the Philips HeartStart FR2+ AED (model number M3860A) or the Laerdal HeartStart FR2+ AED (model number M3840A). FR2+ models without an ECG display (models M3861A or M3841A) are not compatible with the ECG Assessment Module. Any Philips FR2+ AED shipped prior to 11/12/01 will require a software upgrade to use the ECG Assessment Module. If you're looking to buy a Philips HeartStart FR2+ AED there's no need to worry...the AED Superstore only sells the latest models compatible with this accessory! The Module is reusable and latex-free. It consists of a device connector that plugs into the connector socket of the FR2+, a trunk cable terminating in a molded yoke, and three lead wires permanently attached to the yoke. Each lead wire connects to a standard snap style disposable electrode. Three disposable electrodes are included. Open the package containing the FR2+ ECG Assessment Module and remove it. Open the package of ECG electrodes and connect the electrodes to the Module's colored lead wires. Remove the adhesive backing from the ECG electrodes and apply them to the patient's bare chest. Use the color-coded diagram on the Module's device connector as a reference if needed. Turn on your Philips HeartStart FR2+ AED and insert the ECG Assessment Module's device connector into the AED's connector socket firmly until it clicks into place. As always, please consult your device's Operator's Manual for full instructions. When connected, the Philips HeartStart FR2+ displays and evaluates the patient's ECG and heart rate. If your FR2+ has the optional Data Card and Tray (part number M3854A) installed, all recorded events may be viewed later using Philips' free event review software and a Data Card Reader. The AED Superstore has a great price on the Philips HeartStart FR2+ AED ECG Assessment Module and free ground shipping within the lower 48 United States is included. To place an order just call us and a friendly, knowledgeable customer service agent will help you. Or, click to add it to your cart to purchase online. It's fast, safe and secure!